We were given a chance to review Party Bags and Supplies and it came just at the right time! My daughter and son have exactly one week between their birthdays and this year they were having separate parties. My daughter's party on the Saturday morning and my son's birthday the next day, on the Sunday afternoon. Knowing that it was going to be pretty busy for me, I thought this review couldn't have been better timed! Having just got back from Disneyland Paris, I opted for the Mickey Mouse Clubhouse party bags. Luckily just a week before her party, my daughter requested a Mickey Mouse party! 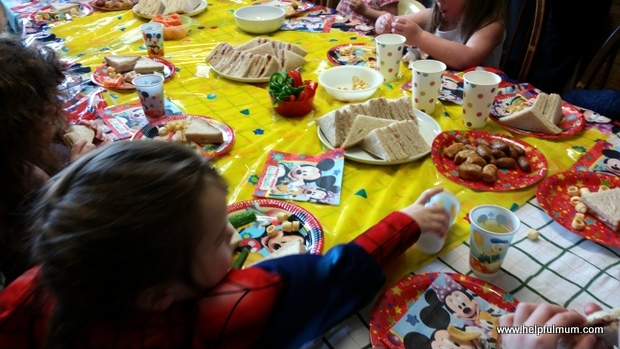 As part of the bundle, we received plates, cups, napkins, a tablecloth and filled party bags. The tablecloth was sturdier than I imagined and we have held on to it so that we can use it next year. We did buy some extra paper cups as I know from previous experience just how many children can get through in a couple of hours! There were 20 napkins in the pack, which I thought was brilliant as it was great to have enough to wrap the cake up in the party bag afterwards, along with a couple of leftovers. I was very impressed with the contents of the party bags. There were some colouring pencils, a colouring in sheet, a small pack of Haribo, a small frisbee, stickers, clapping hands and a spinning top. Once I had added some birthday cake to the mix, the bags looked full. I was really impressed with this pack and it certainly took a big part of the planning out of the equation for me, which was great. For more information check out Party Bags and Supplies Website.